Lots of quotes and links to the best research over the last twenty years! This KIDS COUNT policy report makes the case for an integrated and comprehensive solution to meet the developmental needs of all children through age 8. More effectively meet the diverse literacy needs of the growing Latino population by learning how to evaluate and select quality Latino children's literature. * Figures relating to Latino population growth, home language of Latinos, and stressors of recently arrived Latinos * Extensive bibliography of print and web resources for developing collections of quality materials about Latino cultures, professional publications related relating to evaluating Latino children's literature and integrating the literature into classrooms and libraries, and recommended English, Spanish, and bilingual children's and young adult books about Latinos * Contains useful resources such as reproducible bookmarks of recommended Latino children's books, evaluation sheets for analyzing Latino children's books for stereotypes, and a bingo sheet for professional development related to library services for Latinos and Latino children. "The all-in-one resource you've been clamoring for, this book presents a comprehensive package of literacy-based public library programming ideas designed for children in kindergarten through the early tweens. Chock full of strategies and best practices for promoting literacy and reading skill development, it also features numerous planning templates and other materials ready to print and adapt as needed. 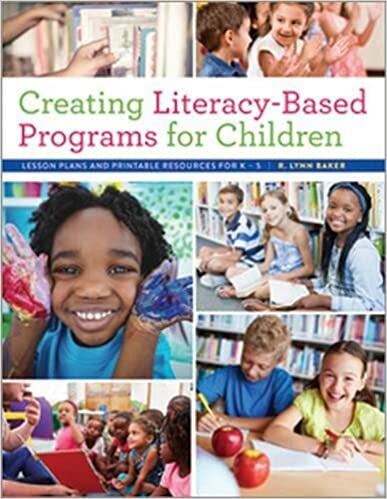 With specific guidance for improving and streamlining each step of program planning and implementation, this book: defines literacy and reading skills by grade levels, in addition to information on other developmental stages; explains multiliteracies and connects them to programming practices; provides step-by-step program planning guides, arranged by grade level, which include book-based programs, clubs, makerspaces, afterschool/study programs, author/guest visits, family/all age programs, impromptu programming, and many others; offers STEAM-based programs which connect to science, technology, engineering, art, and mathematics; gives advice on collaborating effectively with school librarians and teachers to plan school field trips; addresses large event and summer reading program planning; shows how to program for children with special needs; and shares tips and suggestions for getting the word out through advocacy and marketing." Drawing on the authors' research, this book covers: the background and context of early years literacy; the role of the early years professional, interdisciplinary team work, and how to involve parents and carers; buildings and space; managing resources and collection development; planning projects and running literacy sessions; and case studies. Tip cards contain developmental tips concerning physical, social and emotional development, approaches to learning, language and literacy, cognition and general knowledge, mathematical and scientific thinking and the arts, with suggestions for age-appropriateness for babies, toddlers and preschoolers for each activity described by the card. This one-stop guide to nurturing six core early literacy skills at your library also offers practical tips for sharing these skills with parents, teachers, and other caregivers so they can institute them in playgroups, in school, or at home. * Guides you in launching an early literacy program no matter the size of your library or budget * Simplifies the implementation of early literacy initiatives in your library * Helps you to educate parents and childcare providers on the importance of fostering literacy skills in young children * Suggest methods you can employ to involve parents in developing early literacy skills. Based on the groundbreaking research of VIEWS2-the first systematic study of storytimes done to date-this book recommends simple interactive ways to emphasize early literacy techniques and encourage children to use and practice their pre-reading skills while preserving the delight inherent in storytime. And unlike many other storytime resources, the authors use the findings of VIEWS2 to offer guidance in performing assessment, as well as giving tips for planning and conducting storytimes. Put simply this book assists storytime presenters, children's librarians, and others involved with early literacy by presenting ready-to-use planning tools based on early learning benchmarks with a clear focus on developmental stages; demonstrating how to foster early literacy development by inserting the VIEWS2 early literacy domains into the five practices from the second edition of Every Child Ready to Read(r) @ your Library(r); interweaving testimonials from storytime practitioners throughout the text to provide real-world insight; showing how storytime presenters can connect with parents and caregivers to promote family engagement; providing guidelines, worksheets, and recommendations for storytime assessment, with particular attention to self-reflection and peer-to-peer community learning; highlighting professional development resources that encourage sharing and problem-solving within the larger community of children's and youth librarians; and providing administrators with research-based evidence that supports current and future advocacy for early literacy in public library programming for children. Using this book's systematic approach, readers will be able to plan their storytimes with a clear idea of what to look for in the children they serve, and then continually improve how they meet the needs of their communities.